ROCK OF GIBRALTAR (IRE) (Bay 1999-Stud 2003). 10 wins-5 at 2, The Two Thousand Guineas, Gr.1. Sire of 1815 rnrs, 1167 wnrs, 115 SW, inc. Alboran Sea (Scottsville Allan Robertson Championship, Gr.1), Eagle Mountain, Varenar, Society Rock, Diamondrella, Prince Gibraltar, Samitar, Europa Point, Mount Nelson, Admiral, Seventh Rock, Brillo de Sol, Cascada Sureña, Rock Kingdom, Ajaxana, Belle de Crecy, Gibraltar Blue, Arcetri Pink, Lovetrista, etc. Aquitania (g. by Due Sasso). 3 wins at 1000m, 1100m, A$76,786, WATC Lawrence Peter Ferris H., 2d WATC CMEIG H., 3d WATC Myer Fashion H., Tabtouch.mobi H., Skyy Vodka H.
Jester Rock (g. by Rock of Gibraltar). 4 wins. See below. TRACK JESTER (Tenby). 9 wins from 1200m to 1600m, A$215,135, WATC Asian Beau S., Gr.3, Limber H., Farmer H., Sister Patricia H., Emporium Welter H., Secret Weapon H., Schillaci H., Enjoy Healthy Eating H., Summer Beau H., 2d WATC New Year Welter H., Domain Project Management H., Marauding H., Kim Angel H., Common Touch H., Cannoneer H., Budget Business Club H., 3d WATC Cadenas Welter H., Emu Export H., Tudor Mak H., 4th WATC Birthday S., L.
Empress of Ireland. 2 wins at 1000m, 1100m, 2d WATC Racing Radio 1206AM H.
Jester Moment. Winner. See above. Manahatn (Danetime). 6 wins at 1200m, 1300m, A$161,268, WATC Jones Ballard Property Group H., Airconditioning Mart H., Opening Twist H., 2d WATC Go for 2&5 H., 3d WATC Australia Day S., L, Hegney Property Group H., Medicine Kid H., Big Couch H., Colorbond Steel H.
Roger the Roman. 5 wins to 1100m, A$121,075, to 2016-17, WATC Amelia Park H., 2d WATC Yellowglen H., St Pats Raceday Next Saturday H., Westspeed Noms Closing H., 3d WATC Singin in the Rain H., James Boag's Premium H.
Teen Idol. 5 wins at 1000m, 1100m, A$180,825, WATC Singapore Turf Club Trophy H., Tabozbet.com.au H., Playeronline.com.au H., Crown Perth Opening Day at Ascot H., 2d WATC Crown Perth Sprint H., Carlton United Brewers H.
SHEIDEL (Holy Roman Emperor). 14 wins-2 at 2-to 1200m, A$1,269,450, to 2016-17, VRC GH Mumm S., Gr.3, MRC Cape Grim Beef Steaks, Gr.3, Bel Esprit S., L, WATC Jungle Mist Classic, L, RS Crawford S., L, Summer Scorcher, L, Westspeed H., Westspeed Nursery H., Kalatiara Classic, Classic Meats H., Westspeed Nursery H., Westspeed H., Westminster National Property Finance H., Galvin's Plumbing H., 2d SAJC Robert Sangster Classic, Gr.1, WATC Winterbottom S., Gr.1, MRC Mypunter.com H., WATC Westspeed Nursery H., Irish Day Trophy H., 3d MVRC Jeep 55 Second Challenge Heat 16 H., 4th MVRC Ian McEwen S., Gr.2, WATC Colonel Reeves S., Gr.3. LATORIA (Oratorio). 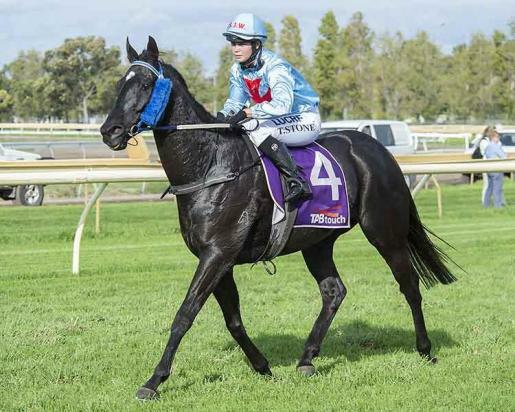 7 wins at 1000m, 1200m, A$232,965, WATC Summer Scorcher H., L, Call TAB to Bet 132 369 H., Perth Racing on Facebook H., Tabtouch.mobi H., Carlton Dry H., Lord Mayor's Cup, 2d WATC Beaufine S., L, Festival of Perth Racing H., Perthracing.com.au H., Ladies Day Luncheon H., 3d WATC Miss Andretti H., L, Racingjobs.com.au H., 4th WATC S., L.
Tre Amici. 4 wins at 1000m, 1100m to 2015-16, WATC Super Saturday H., Perth's Original NYD Event Perth Cup Raceday H., Perth Racing Twitter H., 2d WATC Perth Racing on Facebook & Twitter H., 3d WATC Yellowglen H., Perth Racing Ascothappens H.
John's Ally. 6 wins from 1200m to 1600m, WATC Gwynne H., 3d WATC Man o War Welter H.
Fer Forge. 3 wins. See above. Connaughton. Winner at 1100m in Aust. Influential Lady. Winner at 1150m in Aust. Count Sanavik. Winner at 1200m in Aust. Race Record: 27 Starts 4-4-4 A$62,690. 4 wins to 1400m to 2015-16, 2d WATC Ladies Day Luncheon Saturday H., Terrace Restaurant H., 3d WATC Bonanza H.